Resource depletion and population pressures are about to catch up with us, and no one is prepared. Oil is running out and, if the Western world continues with its current policies, the next decades will likely be marked by war, economic collapse, and environmental catastrophe. The political élites, especially in the US, have shown themselves to be unwilling to deal with the situation, and have in mind a punishing game of "Last One Standing". There are alternatives. A "Powerdown" strategy, for example, would aim to reduce per-capita resource usage in wealthy countries, develop alternative energy sources, distribute resources more equitably, and reduce the human population humanely but systematically over time. It could save us, but will require tremendous effort and economic sacrifice. * Building Lifeboats: the path of community solidarity and preservation. Finally, the book explores how three important groups within global society - the power élites, the organized opposition to the élites (the "activist" movements), and ordinary people - are likely to respond to these four options. 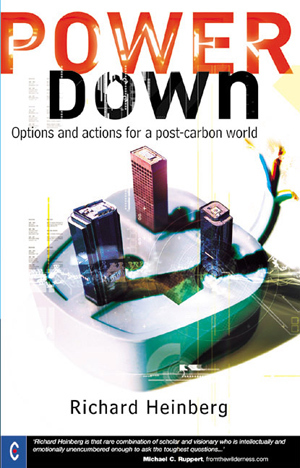 Timely, accessible and eloquent, Powerdown is clarion call to urgent action. RICHARD HEINBERG has been writing about energy resources issues and the dynamics of cultural change for many years. A member of the core faculty at New College of California, he is an award-winning author of three previous books, including The Party's Over, Oil War and the Fate of Industrial Societies (2003). His Museletter was nominated for the Utne Reader?s "Best Alternative Newsletter" award in 1993. He lives in Santa Rosa, CA.